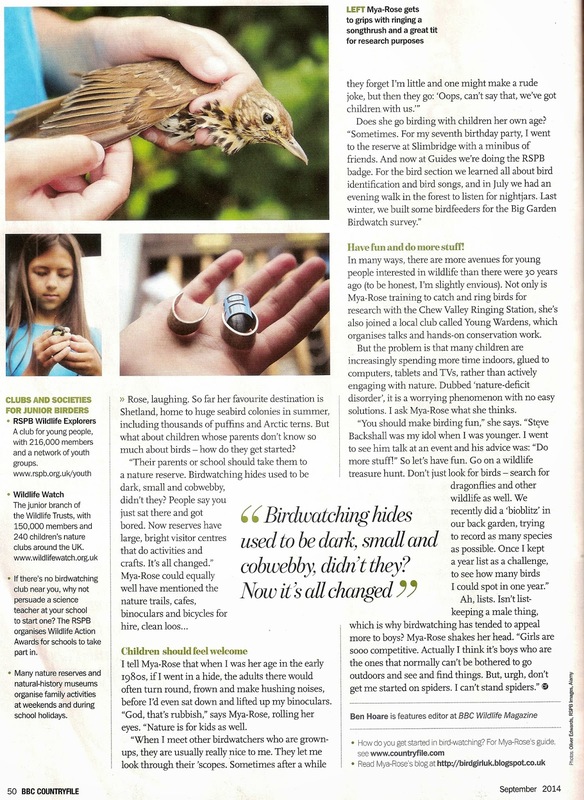 Last year I was interviewed by Ben Hoare, the features editor at BBC Wildlife Magazine, for an article in BBC Countryfile Magazine. I met Ben at Chew Valley Lake at the beautiful Woodford Lodge. We had an amazing time chatting about birds and anything else that came up. We were chatting so much that we ended up being there for a couple of hours. I had loads of fun, really enjoying my first proper interview! So much that I forgot all about the tape recorder. A few weeks later, I met Oliver Edwards a photographer from Bristol, at the Chew Valley Ringing Station. Oliver took lots of photographs of me at the ringing station and around the lake, which I also really enjoyed. It did not take long for me to get over any slight shyness! 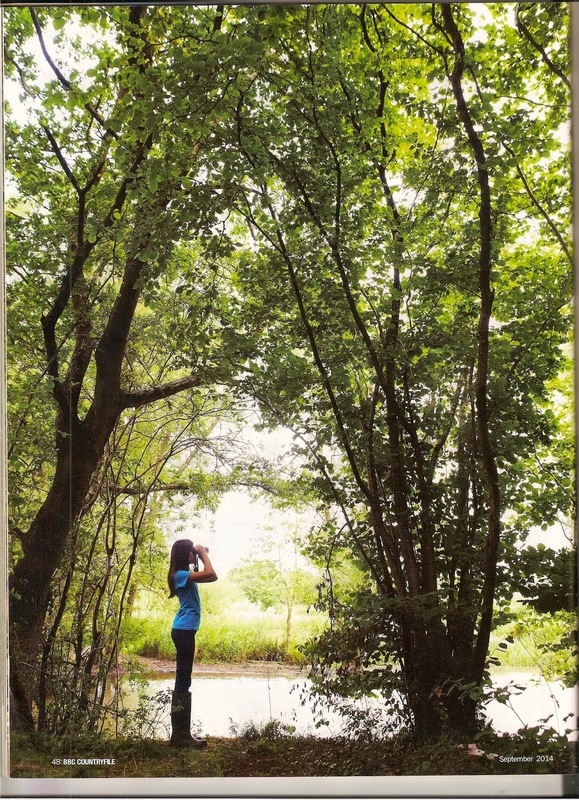 He was an amazing photographer and I love having so many cool photographs of me birding and ringing. 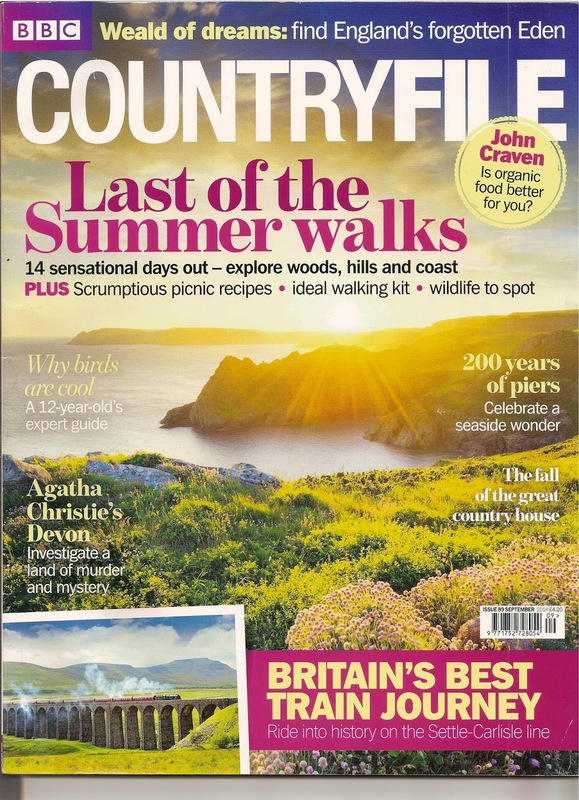 The interview was published in the September 2014 edition of BBC Countryfile Magazine. 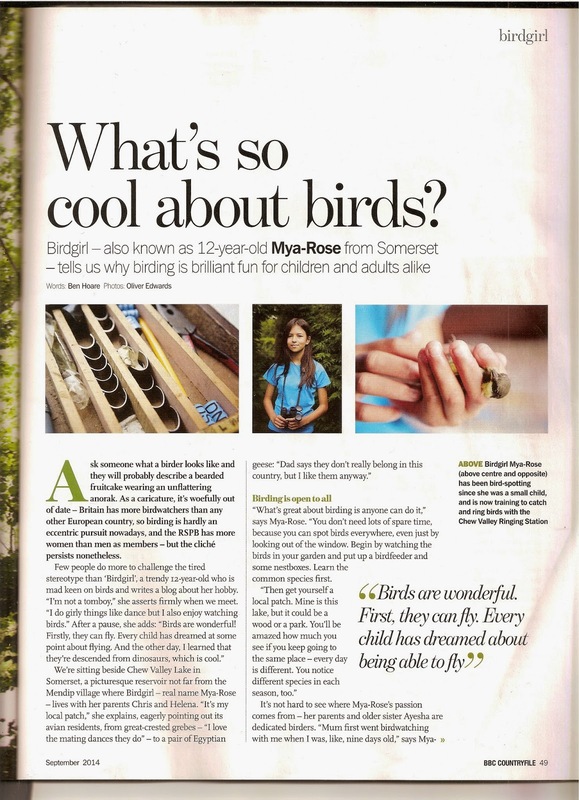 In it I explained why I thought birds were cool and why birding is brilliant fun for children and adults to take part in. There was even a mention of my interview on the front page which was amazing. 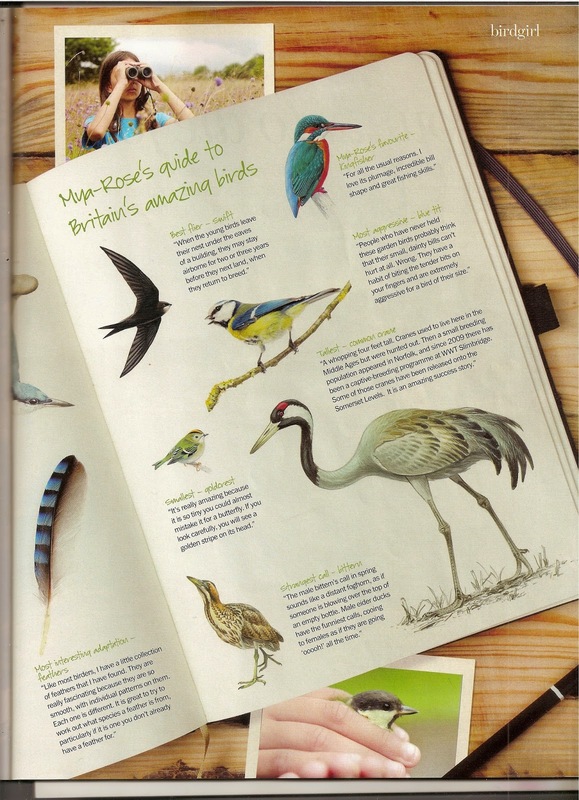 As well as the magazine interview, there was also an on-line article by me, where I shared my top ten tips for bird watching beginners http://bit.ly/1zhu2D8. 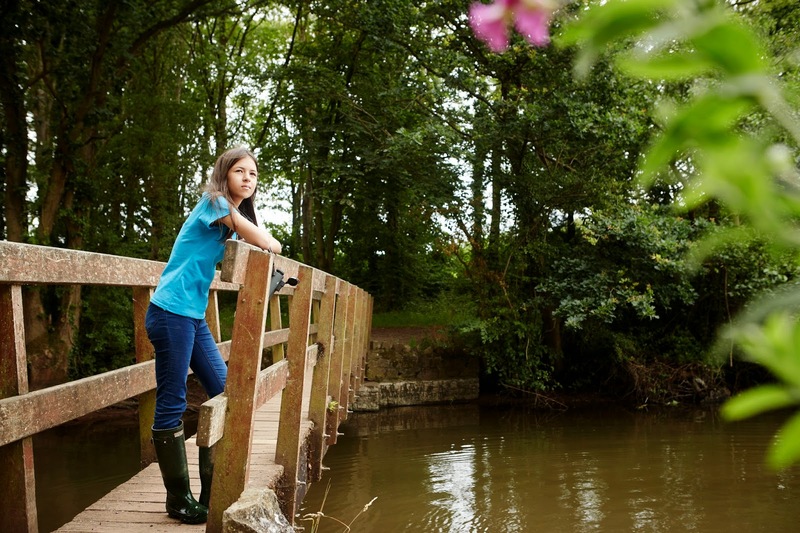 I’m Mya-Rose Craig AKA Birdgirl, I’m 15; I live near Bristol. 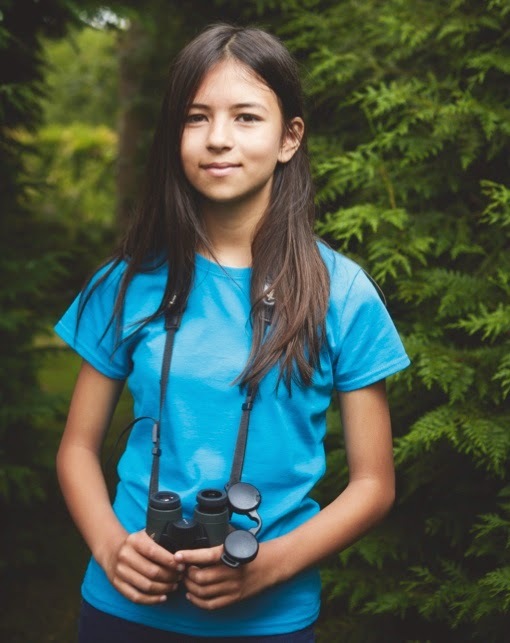 I’m a Young Naturalist, Young Ornithologist, and, Young Birder, (Young Birdwatcher) as well as a Young Environmentalist, Young Conservationist, Young Activist, and Writer. I want to do everything I can to save the environment from damage and persuade people to do the same through my writing, talks & use of media. I’m proud to be a Bristol European Green Capital 2015 Ambassador. I love birding in my garden & locally at Chew Valley Lake. I have been bird ringing (bird banding) at Chew Valley RS since Sept 2011, age 9 and hope to get my C licence when I’m 16. I love British Twitching and get a thrill every time I see a new bird. My big passion is World Birding & I saw my 4000th bird in Kenya in 2015. I have now seen 4,400 birds & my target is to see 5,400 birds, 1/2 the world’s birds, by 18. 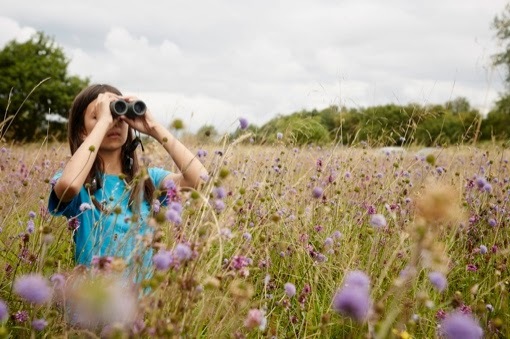 I want to combine my passion for nature & wildlife with my love of adventure to be a nature TV presenter going on expeditions to remote places, looking for rare or undiscovered species, like Steve Backshall. Please like my Birdgirl Facebook Page & follow me on Twitter Birdgirl Twitter. My Mum is at helenabcraig@hotmail.co.uk.